I’ve lost count of the number of people that have told me that their broadband connection is not working properly because an online speed test has reported low or highly variable speeds. You need to be very cautious with online speed tests as they may indicate that your broadband connection is performing much worse than it really is. 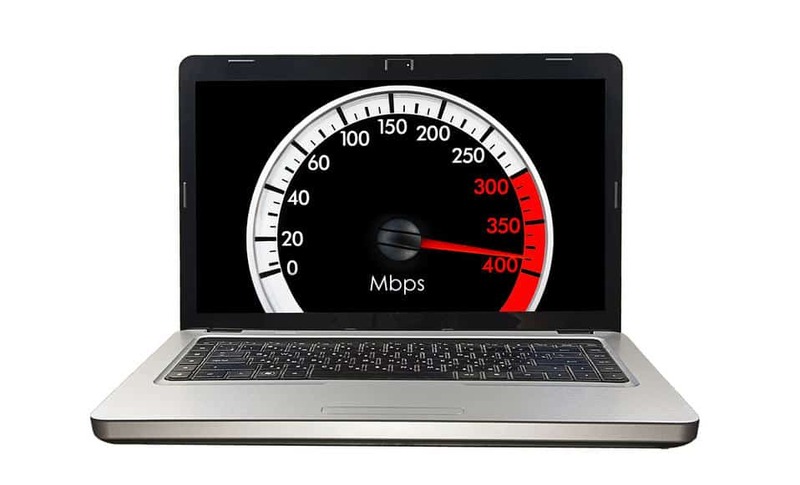 Provided that you take the right precautions and choose the right online speed test (with the right settings), an online speed test can be reasonably accurate and a useful tool to assess a broadband connection. Just because your ISP claims that your broadband connection offers speeds “up to 24 Mbps” (for ADSL2+ conventional broadband) or “up to 80 Mbps” (for VDSL2 fibre broadband), it won’t mean that you’ll be able to achieve such speeds. This is because speeds are dependent on the distance to the exchange (for conventional broadband) or to the street cabinet (for fibre broadband). 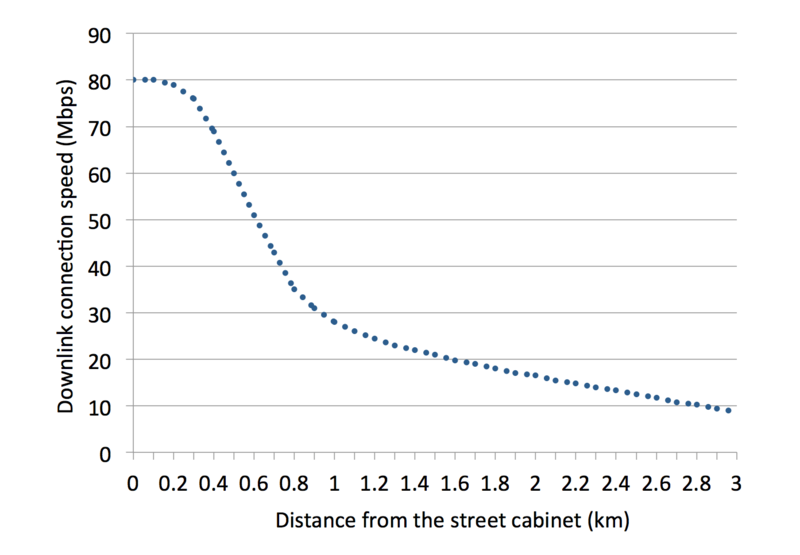 As shown in the chart below, fibre broadband connection speeds decline with distance from the fibre street cabinet. So, if you are located 1 km from your local street cabinet, you'll typically only be able to achieve a connection speed of 25-30 Mbps. Similarly, as described in our article entitled Chart of ADSL and ADSL2+ Speed Versus Distance, the speeds of conventional ADSL2+ and ADSL broadband decline with distance from the BT exchange. Only premises situated within 1 km of the exchange are likely to achieve a downlink connection speed close to the maximum possible. When talking about speeds, many ISPs refer to the connection speed (or "sync speed") of a broadband connection. So, depending on what fibre broadband subscription you have, this can be (depending on the service chosen) up to 80 Mbps or 40 Mbps in the downstream direction. The connection rate is the speed at which your router communicates with the DSLAM equipment (situated in the exchange for ADSL and ADSL2+ or your fibre street cabinet for VDSL2 fibre broadband). It is important to realise that because of the way the broadband system and the Internet have been designed, the actual throughput of your connection (i.e. the real speed for the applications that you use) will be lower than the connection speed. Firstly, there is an overhead in getting the IP packets from the ISP to your modem, which is reflected in the so-called "IP Profile". Secondly, IP packets don’t only contain useful ‘payload’ information and also contain headers about the information sent. As shown in the table below for VDSL fibre broadband, the real throughput (for example, measured by an online speed test) will be significantly lower than the connection speed. So, if you are lucky enough to have a fibre broadband connection with downlink connection speed of 80 Mbps, the actual maximum throughput of your connection would typically be about 75 Mbps. For a connection speed of 40 Mbps, the actual maximum throughput of your connection would be about 37 Mbps. So, if you’re getting these speeds in an online speed test, you simply cannot do any better. With conventional ADSL2+ and ADSL broadband, the IP Profile is also lower than the connection speed. For example, the IP Profile for an ADSL2+ connection is 88.2% of the connection rate (so is less efficient than fibre broadband where the IP Profile is 96.69% of the connection rate). 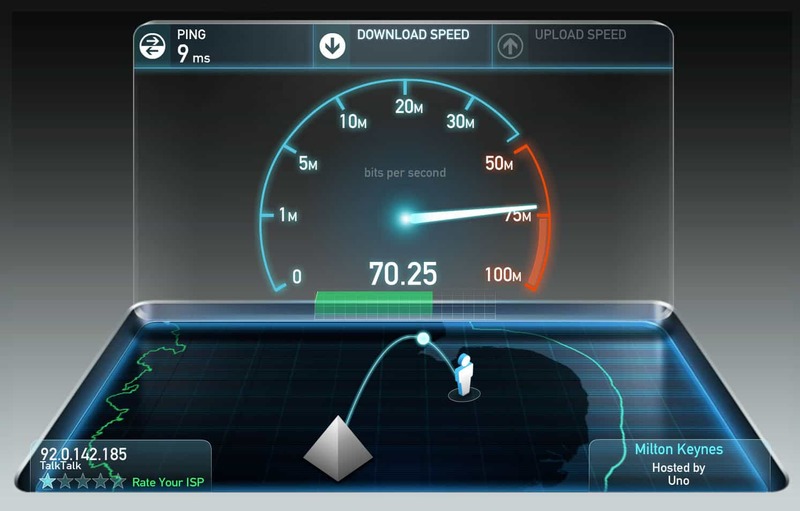 A connection speed of 20 Mbps would equate to an IP Profile of 17.64 Mbps and a maximum throughput of about 17 Mbps. Directly connect your device to your router by Ethernet cable. Avoid running an online speed test if connected to your router by WiFi (or a powerline adapter). As described in our WiFi optimisation page, your WiFi network could be the weak link in your broadband chain so you’ll end up measuring the speed of your WiFi connection rather than your broadband connection. Furthermore, WiFi interference issues can often cause rapid fluctuations in online speed test results. If you have no alternative than to use WiFi (for example, you are using a tablet), then ensure that your WiFi is optimised (using our WiFi optimisation guide) and be located next to your WiFi router. There are significant differences in the accuracy and reliability of online speed tests. Quite frankly, many online speed tests are a complete waste of time, results from which will bear little resemblance to your actual throughputs. There are only two online speed tests that we recommend. Based on extensive measurements, OOKLA (once configured correctly, as will be explained) provides consistent and relatively accurate results. 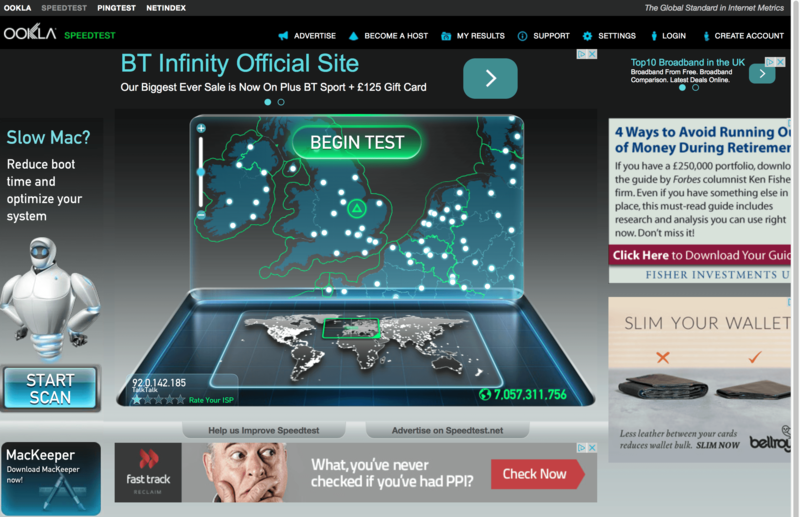 OOKLA claims to be “the world’s most popular Internet speed test” with over 5 million tests per day. OOKLA provides global coverage, with speed tests available from more than 3,500 servers worldwide. It is critically important to select the most appropriate server, and it may take several attempts to determine the best server available. When you run an OOKLA online speed test, a server is automatically selected. We have found on numerous occasions that the server selected is not necessarily the best available and can give inaccurate results for a number of reasons (including the server being overloaded). You have the opportunity to pick an alternative server, and you should try a range of servers that are relatively close to your location. Over time, you will probably discover that a particular server (even if it not one of your closest servers) provides the highest and most consistent results. Ensure you select this server every time you run an online speed test. There are many third parties online that use OOKLA in different guises. However, these generally do not offer the opportunity to choose different servers. Therefore, we strongly recommend that you use OOKLA speed tests using the main page www.speedtest.net. 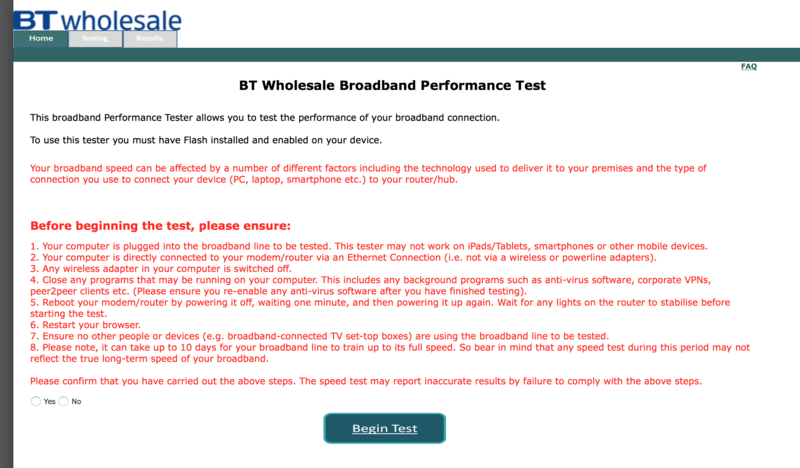 While BT and other ISPs offer a range of online speed tests, by far the best is the Broadband Performance Test provided by BT Wholesale. To use the tester, you must have Flash installed and enabled on your device. To start the speed test, it is important to tick the confirmation box in the bottom left corner. While the user interface is not particularly appealing, and you have to wait until testing is complete to see results (whereas OOKLA gives more immediate feedback), results are generally accurate and consistent. An extra benefit from the BT Wholesale checker is the ability to find out the IP Profile on your connection (if you subscribe to a service delivered by BT Wholesale, for example, BT, Plusnet and many other ISPs). 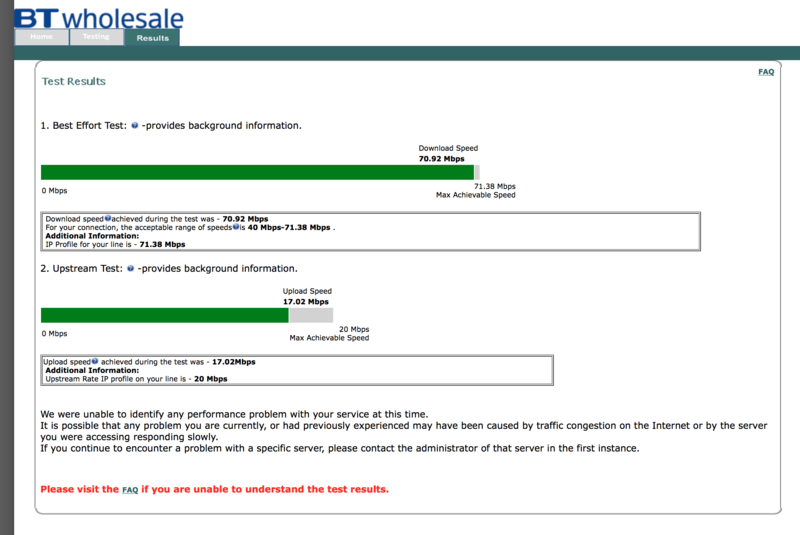 Once a speed test has been run, you can select the ‘Further Diagnostics’ option at the bottom of the screen. You’ll need to enter your telephone number and then select ‘Run Diagnostic Test’. This will provide you with the IP Profile of your line, which can help to diagnose a stuck IP profile or problems with your line if the IP profile is abnormally low. We have not found any other online speed tests that consistently give as accurate results as the main OOKLA site (provided that the server is manually chosen) and the BT Wholesale checker. Our Increase Broadband Speed Guide provides tips to substantially increase your broadband speed. Your WiFi could be the bottleneck in your broadband connection. Use our WiFi Optimisation Guide to ensure you get the fastest speeds possible.